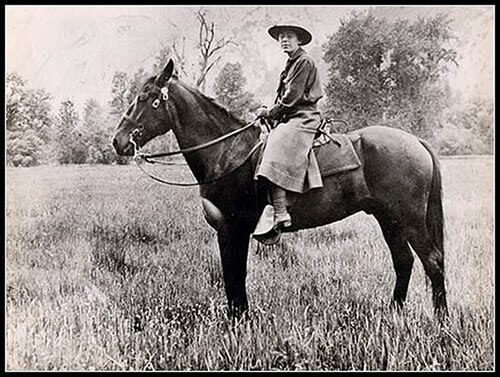 Clare Marie Hodges was the first woman ranger in Yosemite National Park and is generally considered to be the first fully commissioned female ranger in the National Park Service. Born in Santa Cruz in 1890, Hodges first visited Yosemite at the age of fourteen, arriving after a four-day horseback ride. Falling in love with Yosemite Valley, Hodges returned to the valley in 1916 to teach at the Yosemite School. Two years later, during World War I, Hodges applied to Park Superintendent Washington B. Lewis for a job as a park ranger. During the war, due to shortages of available male applicants, women were often selected to serve in non-traditional roles, such as police officers and factory workers. Much to Clare’s surprise, Lewis hired her as a ranger in spring 1918. Though it would not become standard operating procedure for female rangers until the 1970s, Hodges wore the same uniform, Stetson hat and badge, as the men. She had the same duties and responsibilities as her male counterparts. The only exception was her refusal to carry a gun. She served until September 1918. Soon after leaving park service, Hodges married Peter Wolfsen, a Mariposa cattle rancher, and the couple became active in local affairs. Clare guided groups in the Yosemite region and became particularly active with Camp Wawona, operated by the Seventh-day Adventist Church, on property partly donated by Clare and Peter Wolfsen. Clare became the first naturalist at Camp Wawona. Following their deaths, Mariposa County named a nature trail in honor of the Wolfsens. Clare Marie Hodges Wolfsen died in 1980 at the age of 89.